This early model of Taylor Brothers is of the famous Guinea hand saw. The saw has a straight back cast steel blade fitted with a hardwood handle, usually made from Beech. The wooden handle is fitted to the saw blade with the use of four brass split-nut buttons. Uncommonly for most old saws this saw has two buttons which are faced with medallions. 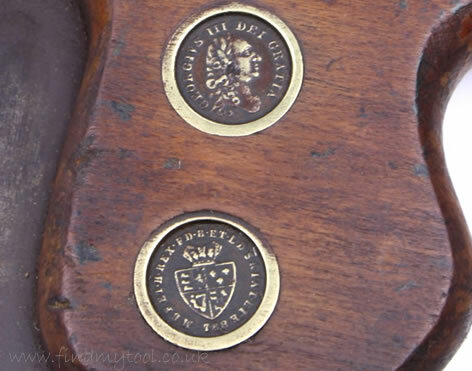 One of the medallions has the wording 'Georgivs III Dei Gratia', the other has an image of an old George III Royal crest. Each of the medallions replicates one side of the George III Guinea Gold Coin from the late 1700's - early 1800's. If required, the split-nut buttons can be adjusted on the reverse side of the handle with the use of a special split-nut screwdriver. This Taylor Brothers saw was made at the Adelaide Saw Works in Sheffield, England. Medallion Markings 2: ‘MBFEI H REX FD B ETLD SRIATETE 788’ (I believe that is what it says), it also has a crest. For information on dating this saw and other British saws, see the 'British Saws and Saw Makers from c1660' book, written by Simon Barley. The book is the most comprehensive saw directory to date listing makers, makers marks and manufacturing dates. 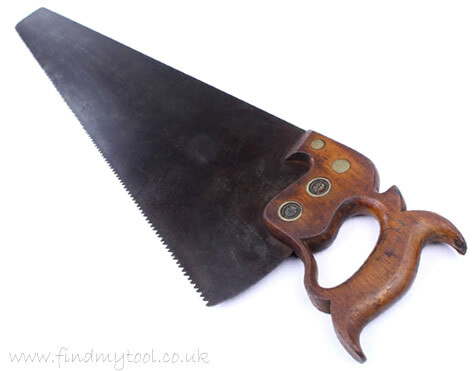 There is also a whole host of additional information on the history of saw making, how to date a saw, in depth details on each of the large makers and much more, making for the most interesting read and leaving you with a slight desire to buy an old British saw.